The Dr. Tom Pashby Sports Safety Fund was founded to promote the prevention of eye, spinal cord and other debilitating injuries occurring in sports and recreational activities, through public education, research, develop- ment of prevention programs and the monitoring of the effectiveness of such programs. Through his untiring efforts it became mandatory for minor hockey players to wear CSA certified face protec- tors, eliminating lost eyesight among Canadas youth hockey players. Having completed this project, Dr. Pashby has now turned his attention and expertise towards other catastrophic sports injuries. The HDCO would like to acknowledge the Dr. Tom Pashby Sports Safety Fund for its continuing support of projects such as A Guide to Fitting Hockey Equipment. Without their generous support, this initiative would not have been possible. Thank you Doc! Now, please use this guide as a reference tool when purchasing new or used equipment and remember to enjoy every minute that you are on the ice, its a great place to be! Play safe, clean and have respect for your opponent. This guide is intended to be used by parents, coaches, trainers and players when selecting appropriate protective equipment before stepping on the ice. The information contained herein should only be used as a guideline when purchasing hockey equipment. Three important factors should be stressed when evaluating hockey equipment: (A) that the equipment is in proper condition, (B) that the equipment is properly maintained throughout its life span and (C) that the equipment fits properly. A. If any piece of equipment is cracked or is structurally unsound, it should be replaced immediately or properly repaired by a professional. Equipment should be inspected often so that all breaks can be recognized immediately and properly attended to. B. All equipment should be dried after every game or practice. This reduces deterioration in the equipments structure and quality. Skate blades and holders should be completely dried immediately after every game or practice. This will prevent deterioration of the blade. Proper maintenance involves examining all equipment frequently throughout its life span. C. Equipment should cover the entire area of the body that it is meant to cover. Equipment should never be bought to grow into. This leaves the player at risk of serious injury as equipment that is too big will slide away from the area that it is protecting. The cap of the shin pad should be centred on the kneecap. w The bottom of the pad should fit where the foot and the leg meet at a 90-degree angle. Before sizing skates, check the persons feet for any irregularities which would affect the size of skate. There should be one finger width space between the players heel and the back of the boot. When completely laced, eyelets should be 1.5  2 inches apart. When lifting arms, pads should not dig into the neck of the player as this may cause injury and discomfort. w Check pads and straps regularly for damage. Should fit the players hands snugly, but not too tight. When fitting, a proper measurement should be taken from the front of the helmet to the bottom of the players chin. 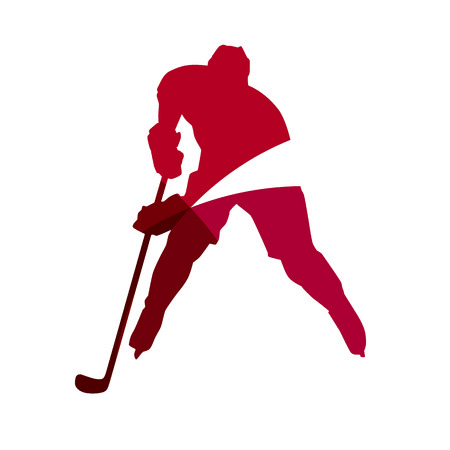 Type I  for players 10 years or older (excluding goaltenders), denoted by a white CSA sticker. Type II  for players 10 years and under (excluding goaltenders), denoted by an orange CSA sticker. Type III  for goaltenders of any age, denoted by a blue CSA sticker. Type IV  for players at the Major Junior level and up, denoted by a yellow CSA sticker. An internal mouthguard may be attached to the facemask to protect the players teeth and to help reduce the risk of concussion. It is recommended that the mouthguard be fitted by a dental practitioner. Check that mask is compatible with helmet. w Be sure to clean visor after every use. Be aware of players personal preference when purchasing a hockey stick. or contact your local hockey association.